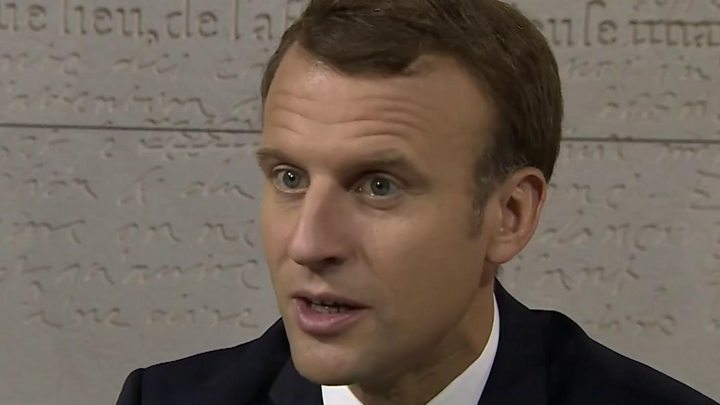 French President Emmanuel Macron says Donald Trump and Vladimir Putin are threatening Western values of openness and tolerance, but isolating them from Europe would be counterproductive. "If you decide just to push them back from Europe and our values, saying 'you're betraying our values', you lose them," he told the BBC. Many see the US and Russian leaders as resistant to liberal "elite" values. Mr Macron was speaking in Abu Dhabi, where he opened a new Louvre Museum. He called it a symbol of tolerance and diversity in the region. "We're at the epicentre of a series of conflicts and battles inside the Muslim world," he said in an interview at the weekend. "It's very important to me to support those defending an open Islam." He said the West had made a mistake in abandoning a "grand narrative" around its values and identity, and that France had a role in defending them abroad. "You need a collective narrative, a common goal, common imagination," he said. "It was the strength of Daesh [so-called Islamic State] - it was a promise of death. "And I think one of the problems of Western society and Western countries during the past decade was to abandon imagination, ambition, vision. "No one falls in love with the single market, the financial market, labour reforms or budget perspective," he continued. "[People] are motivated because of a big narrative." He said it was "paranoia, their [sense of] threat, and their willingness to protect something" that made leaders such as President Putin choose a different path, but that the Russian president was forgetting that part of his country's own civilisation was about openness, and that its future was directly linked to Europe. Mr Macron took office six months ago, promising to transform France's economy, society, even its identity. Since then he has made 28 foreign trips and set out new proposals for the European Union, designed to give the bloc a collective vision and promote its benefits at home. I knew this trip would be different to most reporting gigs when they took my passport away on the flight out. I didn't see it again until I was flying back to Paris. But then, being part of the presidential press corps is an unusual experience for a regular news correspondent. And there were times when it felt more like a school trip than a reporting gig: the press corps bussed en masse from location to location, fed and watered at appropriate times, and handed detailed information about the president's speeches and schedule. Not once did I order a meal, give a taxi driver directions, or speak to a local person who wasn't a member of the hotel staff. In return, of course, was the rare chance to speak to Mr Macron one-to-one, and film him up-close in a way we've never done before - startling for a crew that's usually battling to get a decent shot of his face at all. And while there was a good deal of waiting around - the media has to be in place hours before the president arrives - it was made an awful lot easier by the food. Wherever we went, the refreshments laid on for the presidential party were surprisingly good. Think perfect miniature French tarts and copious Bollinger champagne. As I say, not your usual reporting trip.